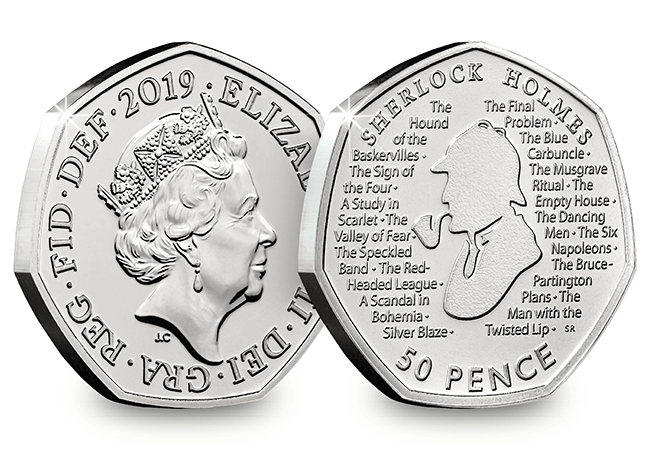 On January 1, 2019, the British Royal Mint released the designs of their 2019 dated coins and began selling the annual sets to collectors. 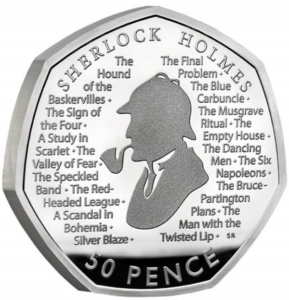 As we predicted in our earlier post about the 2019 Sherlock Holmes 50 Pence coin, there are five different coins for the “completists” that want everything. It won’t be cheap either…. First, let’s describe the design. The obverse features Jody Clark’s portrait of Queen Elizabeth II, that has been in use since 2015. 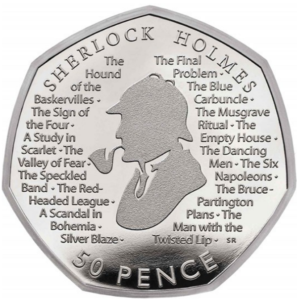 Stephen Raw is the designer of the reverse, featuring Sherlock Holmes and a listing of 16 stories from the Canon. At this time, the coins are not being sold indvidually and are only available in sets. 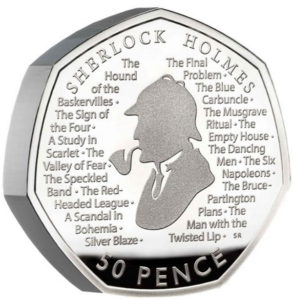 All sets are available directly from the British Royal Mint, and it is likely that individual coins will be on the secondary market in a few weeks. You may wish to do some price comparisons, since one firm is advertising the coin on an online auction service and the cost for a single coin is greater than the price of a set. First, we have the cupro-nickel coins. The 2019 United Kingdom Annual Brilliant Uncirculated Coin Set, consisting of 13 coins, is the source for the brilliant uncirculated cupro-nickel specimen and has a list price of £55.00. 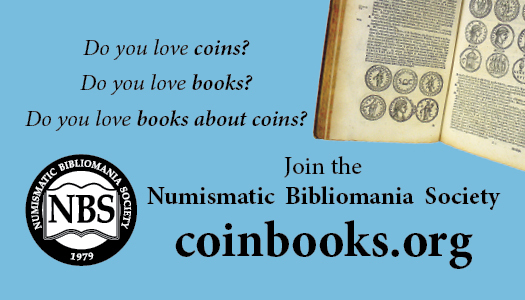 While there are no mintage limits, it is being restricted to 10 sets purchased per household. 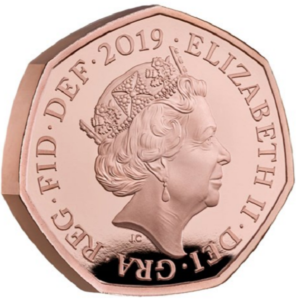 The proof cupro-nickel specimen can be bought in either the 2019 United Kingdom Proof Coin Set or in the 2019 United Kingdom Premium Proof Coin Set. Both sets consist of 13 coins and a medal. The Premium set comes in a wooden case. Total mintage for the proof version is 15,000 coins, with 10,000 in the proof set and 5,000 in the premium set. List price for the proof set is £155.00, and £210.00 for the premium proof set. Now, let’s talk about the silver versions of the coin. Proof specimens of the Silver coin and of the Silver Piedfort coin. The 2019 United Kingdom Silver Proof Coin Set has .925 fine sterling silver versions of all 13 coins that are included in the two previous proof sets that contain the cupro-nickel specimens. Limited to 1,000 sets, the retail price is £610.00. The silver piedfort (which is twice as thick as the “normal” silver coin) is only available in the 2019 United Kingdom Silver Proof Piedfort Commemorative Coin Set. 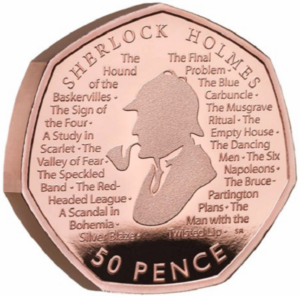 Featuring only the five commemorative coins, the set retails for £550.00 and is limited to 1,000 sets. Purchases for both sets are being limited to 5 sets, each, per household. 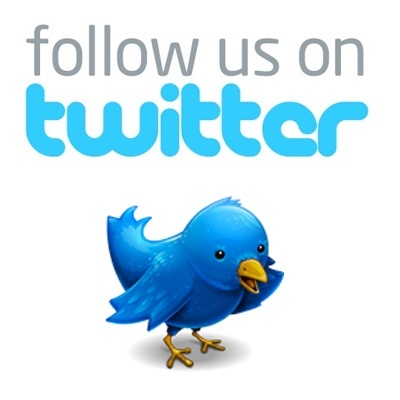 But wait, there’s more…. We have a gold version too! 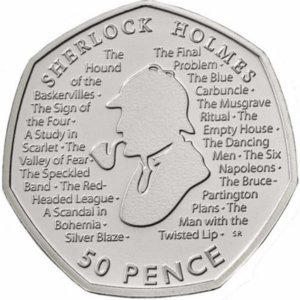 The 2019 United Kingdom Gold Proof Commemorative Coin Set is the only option to purchase the 22 karat gold version of the Sherlock Holmes 50 pence coin. Limited to 125 sets, it retails for £5,250.00, and you can only buy 3 sets. So that is 5 coins for those that want “one of everything.” The year is very young and your editor would not be surprised if there were to be additional marketing efforts, such as albums or postal covers, during the next 364 days. Having said all of that, what do you think of the design?